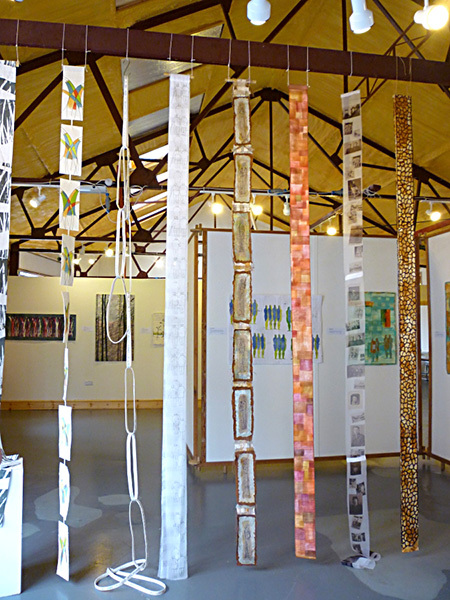 Anglia Textile Works is a group of eight contemporary textile artists who have been working together for almost twenty years. Based in East Anglia, they are mainly inspired by the landscape of that region and the Summer Exhibition at Llanidloes provided a perfect venue for their latest body of work. Members had worked to create four new textile pieces plus a long narrow hanging relating to the theme of Sentinels, the latter being hung en masse very effectively from a high beam. Each artist's own body work was mounted together which provided cohesion and enabled the viewer to see how the works had been individually interpreted. ​Most chose to use the Sentinel theme as their inspiration for their other pieces and it was fascinating to see how widely the word had been interpreted. Kathy Colledge's sentinels were variously sentinel crabs and standing stones on the Isle of Lewis and a stark tree stripped of its foliage standing like a sentinel in the landscape. 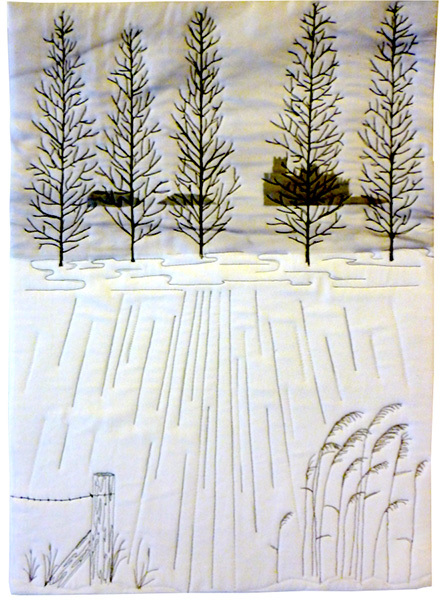 I thought the subtle colour palette of Kathy's pieces was very well chosen and her quilting is exquisite. 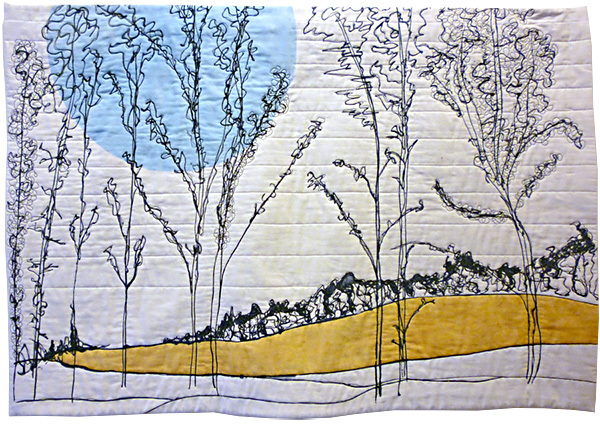 Cherry Vernon-Harcourt's evocative quilts were inspired by the Norfolk landscape and I was intrigued by the quality of the drawn mark that she had achieved with thickened procion dye. Sheila Cetti's pieces also drew inspiration from the open landscape of the Fens and the stark seedheads of the hedgerow plants growing there. ​Chrissy Leach's work too referenced the landscape. Several members had chosen to interpret the Sentinels theme rather more literally as figurative sentinels, but each was inspired by a different source. Yvonne Brown had taken the portal figures at Chartres Cathedral and an effigy of Sir Catesby as her starting point. The images were beautifully free-motion stitched onto rich backgrounds of painted Lutrador and silks and then had been had been richly quilted to give great surface texture. 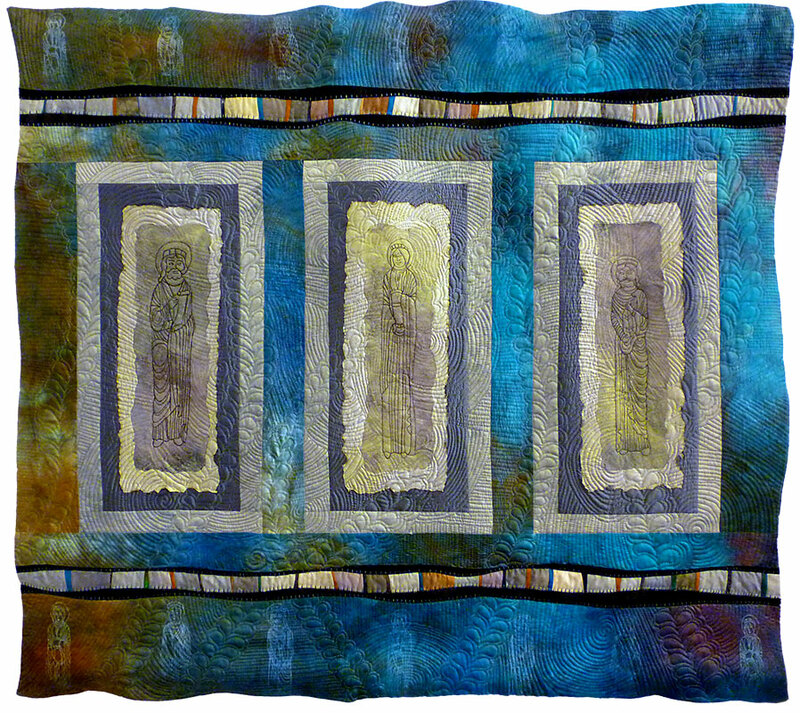 I loved the use of free feathers incorporated into the quilting. Annette Morgan's series of work was based a poem written by a family member about their grandfather who had returned from the First World War, in the words of his wife, 'as a phantom'. 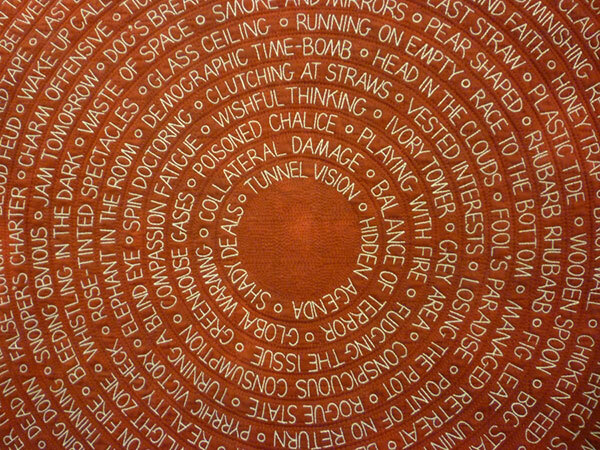 Silhouettes of soldiers together with the screenprinted text of the poem produced haunting images. 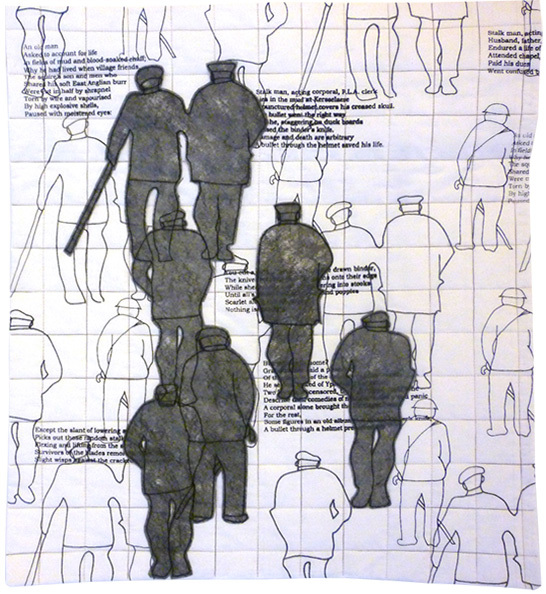 Fay Alwood's pieces also took figures as her main motif, but these had been evoked by images of Anthony Gormley's sculptures at Crosby beach and in Northumberland. 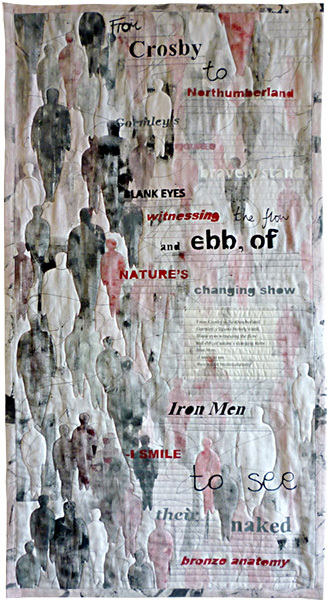 Collaborating with a friend who had written a short poem about these 'iron men' she had combined the figures with printed words from the poem to produce work which was multi-layered and deserving of closer inspection.